b. 1972, Taihape, Aotearoa New Zealand Emma Louise Pratt studied at Ilam School of Fine Art, Canterbury University, New Zealand. 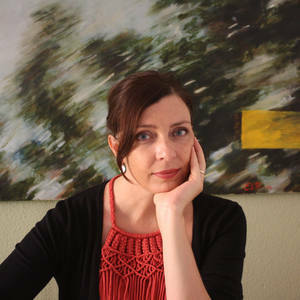 She has been the runner up in the Molly Morpeth Canaday Award (2005), and a finalist in the Norsewear Award (2007) in New Zealand and finalist in the Focus Abengoa International Painting Prize 2014. Emma is known for her landscape based work where she explores specific landscapes that convey significance to her either for their historical or personal importance, serving as they always have, as a personal travel map. WANDERING FOLK AND IDENTITY IN A GLOBAL PRESENT Emma views herself as part of "the wandering folk." Descendant of migrants, and a migrant herself, she always finds herself in the position of the visitor, the outsider, the other. She explores in her work the multifaceted tensions and shifting borders of what identity is in a global present. This reflection is also informed by her training in museology and love of history, both geological and human. She is fascinated by her own children's identity as both children of a foreign mother and local father, living, as they presently do, where their ancestors have lived for thousands of years, a state of belonging that she admits to wishing for herself. With this knowledge and quiet observation of everyday life around her, she interweaves stories of our past, her particular stories and stories of the land where she presently lives. Her landscapes are psychological in their construction. The image is broken down. Foliage, detritus, trees, people, all seem to float and flow about on the surface of the canvas. Layers of geological and human history around her, interlaced with small daily observations of life mix with expressive marks, made with brush, pencil and stylus that take on a life and narrative of their own, as they glide, scratch and dance. Emma has been writing for Art All magazine regularly over the past eight years as well as her own blog www.emmalouisepratt.wordpress.com, touching on themes such a being an artist, learning, art making, identity, raising a family in Seville and the juggling act that all this involves. Emma has exhibited through Whitespace in Auckland, New Zealand since 2005. She began exhibiting her work in TJFA in Palmerston North in 2001. Her 2005 work "The Stations of the Cross" can be found in Saint Andrews in the City, in her home town of Palmerston North, New Zealand http://markandrew.org/ . Art All Magazine is a periodic magazine for the arts sector in Aotearoa New Zealand published by Artists Alliance.